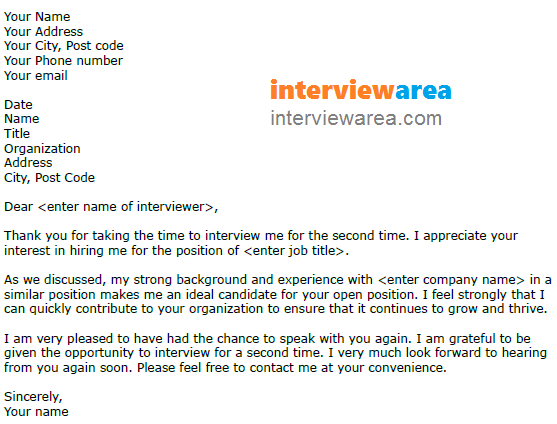 Use this letter example if you have given a second interview and want to say thanks. Thank you for taking the time to interview me for the second time. I appreciate your interest in hiring me for the position of . As we discussed, my strong background and experience with in a similar position makes me an ideal candidate for your open position. I feel strongly that I can quickly contribute to your organization to ensure that it continues to grow and thrive. I am very pleased to have had the chance to speak with you again. I am grateful to be given the opportunity to interview for a second time. I very much look forward to hearing from you again soon. Please feel free to contact me at your convenience.